Thanks to our newest sponsor, hot off the presses (so to speak) the novel “Ari Barak and the Free Will Paradox”. Science fiction you and your kids will love. See www.shaulbehr.com. This is a special episode featuring my interview with author Shaul Behr, author of the kosher science fiction novel: Ari Barak and the Free-Will Paradox. During our conversation, Shaul dropped a number of really good hints and tips for getting through the entire novel-writing process, from inspiration to finished book. His journey from inspiration to finished book is fascinating. Go ahead and order Ari Barak and the Free-Will Paradox now from Amazon, the Book Depository, the BookLocker, Barnes & Noble, and through the author’s website www.shaulbehr.com. When I was growing up, my grandfather used to cut my hair. I had no concept of fashion or style, of course, but I’m sure he did a good job of it. At least for a while when I was a kid, my grandfather used to cut my hair and it was alright for me. So when my boys were born and needed haircuts, I had no trouble getting out the electric hair trimmer and cutting their hair. A special long-form edition of the Y. Karp? Why Not! Podcast is going live this coming Tuesday, featuring my interview with author, Shaul Behr. We talk about his new novel and the trials and tribulations of editing and publishing a book. As the world becomes more and more technology-centric, we become more and more reliant on tech companies to bring us the goods and services that we think we need. Tech companies will rule the world. With the recent launch of the new Star Trek television series “Discovery”, my mind has been wandering again to the idea of whether we are actually alone in the universe. My family will tell you that this is one of my favorite topics because I just can’t believe that out of the 200 billion star systems in this galaxy alone, that there is no other life out there. 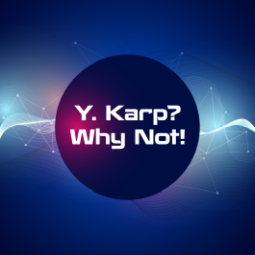 Welcome to the Y Karp? Why Not! Podcast. Episode 1: Unboxing the Podcast. I’m your host, Yossi Karp and I am excited to introduce my new weekly podcast, which is all about technology, writing, gadgets, gizmos, and the stuff of life that makes it interesting! The crazy world of smartphones aliens and space travel our future living under the rule of the tech oligarchy my take on electronic musical instruments and why I gave my kid a funny haircut on purpose Every episode will also feature a discussion on a new, interesting, or innovative product selected from my online Flipboard magazine “Everyone Needs One of These”.